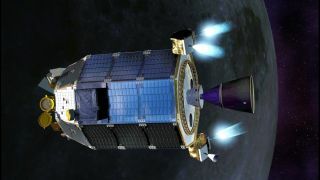 An artist's concept of NASA's Lunar Atmosphere and Dust Environment Explorer (LADEE) spacecraft firing its maneuvering thrusters in order to maintain a safe altitude as it orbits the moon. A NASA spacecraft journeying to the moon is getting there in style with never-before-used spacecraft design. The Lunar Atmosphere and Dust Environment Explorer (LADEE) launched toward the moon Friday (Sept. 6) in a dazzling nighttime liftoff. The mission, which is aimed at exploring long-standing mysteries of the moon's atmosphere and lunar dust, is also the first test of the NASA's new "Modular Common Spacecraft Bus" design. "LADEE’s common bus is an innovative concept that brings NASA a step closer to multi-use designs and assembly line production, while moving away from custom design," S. Pete Worden, the director of NASA's Ames Research Center in Moffett Field, Calif., said in a statement. "This mission will put the common bus design to the test. This same common bus can be used on future missions to explore other destinations, including voyages to orbit and land on the moon, low-Earth orbit, and near-Earth objects." In the past, NASA engineers have developed spacecraft from the ground up for each unique mission, but the $280 million LADEE moon mission marks a change in that method. Instead of creating a very specific spacecraft for the mission, NASA officials took a more generalized approach. LADEE is created from a series of general purpose modules can be mixed and matched to fit many robotic mission parameters in the solar system. "NASA is looking for affordable ways to launch often and inexpensively," David Korsmeyer, director of engineering at NASA Ames, said in a statement. "We can use off-the-shelf components because customized components are expensive to continually develop and improve. If these systems work successfully, NASA will be looking for other commercial technologies to use for space exploration." Just after its flawless Friday night launch, LADEE encountered a technical glitch after separating from the Minotaur V rocket that carried it into space. LADEE's onboard computer shut down the spacecraft's reaction wheels used to stabilize the probe's attitude because they were drawing too much current. Engineers got the wheels up and running again the next day. The spacecraft's design actually saved the probe from a potentially more serious situation. LADEE's solar panels are integrated into the body of the craft unlike many spacecraft that need to deploy folding panels for power. Because of its design, engineers didn't need to immediately correct the attitude of the craft, allowing them some extra time to figure out the situation. "If [the spacecraft] is spinning in some way and the panels aren't getting any sunlight, you would have to do something really quick," Worden said after launch. "One of the nice things about this design is that you [didn't need] to do things suddenly." The LADEE spacecraft the first ever designed, integrated, built and tested by NASA's Ames Research Center, according to space agency officials.